This semester in one of my African American literature courses, I've been organizing a series of activities to give students opportunities to consider Book History. 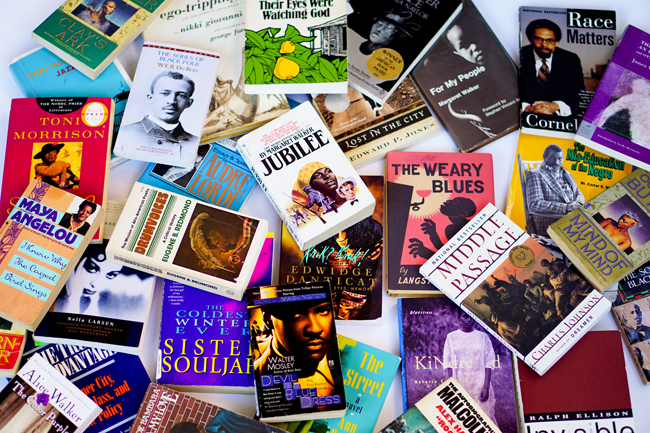 For the past month, we've been exploring only 50 books by African Americans from the 20the century. Later, we'll take a look at 50 books from the 21st century. Some scholars have noted the benefits of young people having exposure to large numbers of books. While American and African American literature courses typically concentrate on a select number of readings, I decided to take a different approach and give students the chance to peruse books and think about the significance of books as cultural artifacts. The series of projects I designed have allowed students to engage with novels, nonfiction works, and volumes of poetry. The downside is that we do not get to cover as many short stories or a few novels, as we’ve done in previous semesters. The upside is that we get a chance to look at a larger field of works. We also get opportunities to consider what a personal library, showcasing black books, might look like.